Thanks to quick-cooking chicken breasts, stuffing mix and canned soup, this chicken skillet main dish is on the table in 25 minutes. Mix hot water, margarine and stuffing mix. Cook chicken in nonstick skillet on medium heat 5 min. on each side. Mix soup and sour cream; pour over chicken. Top with stuffing; cover. Cook on low heat 10 min. or until chicken is done (170ºF). Serve with a bagged green salad tossed with your favourite Kraft Calorie-Wise Dressing. Prepare using reduced-fat condensed cream of mushroom soup and light sour cream. Heat oven to 375°F. Prepare stuffing as directed. 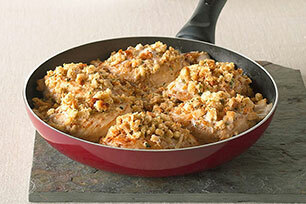 Place chicken in 13x9-inch baking dish or 2.3-L casserole dish. Mix soup and sour cream; pour over chicken. Top with stuffing. Bake 35 min. or until chicken is done.